カカオの実 《熱帯アメリカ産のカカオの木の実; 主にココアとチョコレートの原料; cf. cocoa》. 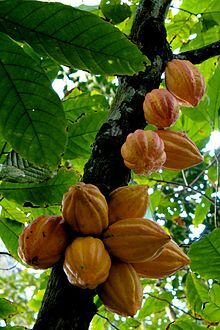 From Spanish cacao, from Classical Nahuatl cacahuatl. A tree, Theobroma cacao, whose seed is used to make chocolate. This tree's seed, the cocoa bean.